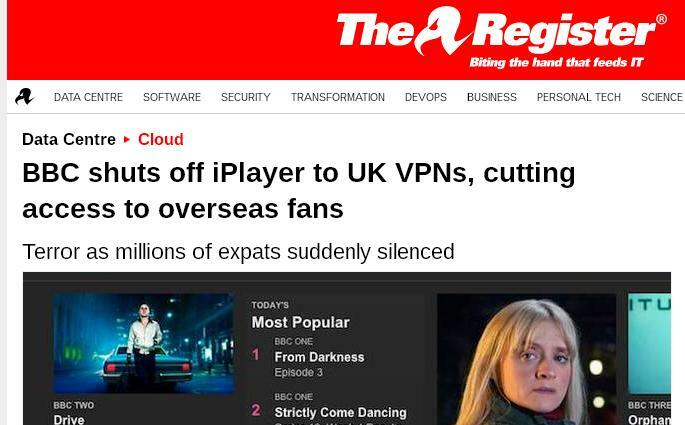 It’s a move that’s been greeted with shock by expats across the world, the BBC have begun to actively block access to iPlayer from outside the UK. Apparently they have been doing this for many years, but to be honest their efforts have looked a little half-hearted until now when thousands are reporting BBC iPlayer detecting VPN services from across the world. People generally bypass these content restrictions by hiding their IP addresses by using proxy or VPN servers based in the country they need. So for example a user in Spain could connect to a UK VPN server as a simple means to get a British IP address. Then they could watch all the ‘UK only’ content like the BBC, ITV, Channel 4 and so on, all the sites would simply see the VPN server’s address. What is more some of the more sophisticated services, now offer the chance to switch to different addresses at will – meaning you could change for a British to an American address whenever you wanted to watch Hulu or a US only site. It was so easy that literally millions of people use these services to watch all sorts of previously blocked channels. You can even use them to swap versions – I use a US VPN to watch US Netflix from the UK which has way more stuff than the UK version. Most of the big media sites have been trying to block these services for years with moderate success. For some years most of them have been able to detect and block simple proxies, but for VPNs it’s a matter of identifying the addresses and blocking them one by one – extremely time consuming considering the thousands of services that exist. The BBC have had a rather ‘laissez faire’ attitude by occasionally blocking a high profile service but usually leaving most alone – this has now changed. Suddenly, many people discovered their usual BBC iPlayer VPN not working – in fact most of these services stopped over night. Over the last few weeks however the BBC has blocked thousands of VPN services. In a move widely believed as a precursor to the BBC’s paid streaming services or even an announcement on the BBC iPlayer USA release date which could be announced shortly. The reality is that people who have been using a VPN to watch the BBC online for years suddenly have been cut off. There is hope, unless the BBC have developed some sort of system for detecting and blocking the use of VPNs automatically – something which the Chinese haven’t even figured out yet – then it’s likely that this will be short lived. Most of the VPN providers will simply switch IP addresses and re-establish connections. Many people suspect that BBC iPlayer VPN workaround, is only suffering a temporary setback. The truth is that although the BBC obviously doesn’t want people to watch BBC iPlayer abroad free of charge, in the long run it’s extremely expensive to keep blocking these services. It’s probably worth avoiding any high profile service and those that heavily promote the TV as a ‘tv watching’ (which they all are) – Identity Cloaker is worth checking out as it is very low key and keeps a low ratio of user to IP address – so far into 2017, it has not been affected by the blocks.